Best deck painting, staining, & top cleaning restorations second to none for Denver! Finding the superb exterior deck care ideas, techniques in Colorado, Eco Paint is your best choice, caring for your wooden structures. Restoring to nearly original condition of your outside deck or wooden structure, having decades of experience, with excellent proven results. Eco Paint’s Denver deck staining restoration services is your exterior woods' top line of defense and protection. Deck stains, paints and finishes are designed to seal, protecting the exposed outside wood, which also enhances your enjoyment outside. Staining, painting decks has never been better today, with the latest stains, products, and techniques provides the very best weatherproofing you can do for your deck. Whether you prefer a solid deck paint stain sealant or true semi-transparent deck stain to keep the natural beauty of the board's wood grain. 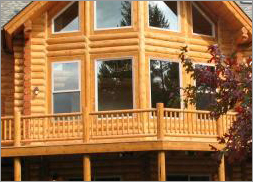 Eco Paint works with only the top deck stain manufacturers, protecting expensive wood from the harsh climates. Staining and painting by utilizing only the best deck weatherproofing professionals in Denver. You know you are getting the very best for your home's outside deck or pergola. See the different types of deck stains below. Solid body deck stains are often referred to as deck paints. Solid body deck stains generally have more solid pigments within the base, looking more like a paint once dried. These types of stains typically soak into the cleaned, opened wood grain 50 ‰, leaving the other 50 ‰ to lay on top, as a thinner mil thickness than a standard 100 ‰ Acrylic Latex paint. Working much better than a standard Latex paint, soaking into the wood, protecting much better, especially for horizontal surfaces. When purchasing solid body deck and fence stains, make sure it says ''For Decks and Fences", as these formulations are best for high traffic, out in the elements, and horizontal surfaces. Coming in a wide variety of colors, solid body deck stain colors are almost infinite just like paint colors can be tinted and mixed. However, it is suggested to use a stock color formulation from that particular manufacture, so there is no question later on, and additional solid stain can be purchased years later, without any question. Advantages of using Solid Body Deck Stains is that these decks generally have less upkeep costs as the years go by. Lasting and outperforming Semi-transparent, and Transparent stains twice as long. Also making touch-ups on high traffic areas a breeze, needing very little time or effort on your part. Some products such as BEHR™ Deck Over, renews old dilapidated wood deck floors to nearly new again, thereby saving you thousands not having to replace costly deck floors and railings. Disadvantages using Solid Body Deck Stains is first thought of covering the natural beauty of the wood grain. Having a mil thickness of paint on top, allows for cracking, chipping, scraping of deck stain surface during some point. If you are a dog lover, having a pooch, a solid body stain may not be the best for your deck. Animals don't necessarily mean to harm deck surface, but their nails wear over time, just like a horse hoof would rather quickly. Also, if your looking for a natural wood finish, this type of deck finish is not for you. Semi-Transparent Stains are the original stains first thought of, remembering a beautiful deck grain, from one of your friends weekend cabin. Semi-Transparent stains have substantial less amount of pigment colorants than do solid body stain, paint types, highlighting the wood grain even more. Semi-Transparent stains and wood finishes from Olympic brings out the wood grain more vividly, enhancing natural wood grain, making them more pronounced. Most of the stain soaks into the cleaned opened grain, protecting the lumber from all elements, as long as the stain is fresh, and has not dried out. Typically Semi-Transparent Stains are an oil based, usually Linseed Oil. Newer ones are water-borne, but both repel water like water rolling off a ducks back. This is always a good way to test your stain, making sure it's still working, by occasionally taking a water-hose rinsing it off. If water repels off, good! If it soaks in, time to stain again. Stains coming in a wide array of shades from BEHR™ Navajo White ST-157 or Taupe ST-153 -to- Forest ST-108 or Slate ST-102. Duckback Superdeck ® offers Semi-Transparent oil based colors ranging from Weathered Gray, to Cedar and Redwood. Water-borne colors range form 2101 Seashell to 2314 Mahogany or 2319 English Walnut. Can see a recently stained deck using Sikkens Cetol Dek in Cedar color. Features include easy to apply. Wood grain can be enjoyed, pleasing to the eye. Can be sprayed, brushed, ragged, or rolled. Making sure working with oil based stains, no rags are left wadded up any length of time, or will ignite and is a combustible petroleum product. Semi-Transparent stains generally do not crack, peel, blister, or bubble. Never wanting to put too much product on wood surface, allowing it to ''Pool'' up, taking longer than 24 hours to dry to the touch. Is an advanced formulation from both manufactures, thereby lasting much longer. Disadvantages would be Semi-Transparent stains generally require more maintenance, additional coats, costing more money over a longer period of time. Very difficult if not impossible to apply over a Solid Body Deck Stain, as these Semi-Transparent ones do not cover, and would make a real mess in the end. If you have a Solid Body Stain, wanting to go to a Semi-Transparent, you will need to strip, sand, and clean all old stain off first, before applying the Semi-Transparent type. Transparent Stains closely follow its' predecessor, Semi-Transparent above, except the Transparent type has even less color particulates, making for a clear, natural wood grain finish. When applying, don't fret if the wood darkens up, because your putting on a wet finish, and wood will need a few days to completely dry out to a uniform stain finish. Deck cleaning is the key to a quality deck stain application. Cleaning is the first part listed, of an extensive procedure caring for your wooden deck, or outdoor cover. Deck cleaning is essential for any deck that has been neglected for any length of time. Using state of the art equipment, with best cleaning products available, Eco Paint can transform any quality wood deck or pergola, giving new life to the wood before any deck treatment is applied. Deck finishing restoration services include Eco-friendly deck cleaning, sanding with official deck sanders, power washing, and pressure cleaning if needed for complete deck staining and staining reapplication with maintenance programs. Eco Paint has finished, restoring thousands of decks in Colorado, which offers many types of deck finishes available. Let us guide you in choosing which stain finish would be best suited for your particular outside deck. 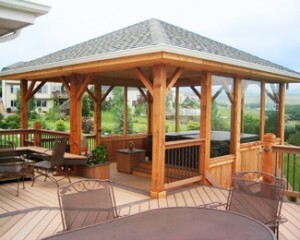 Staining your deck and or pergola is an absolute necessity to keep it sealed and protected. If your wood deck is starting to look weathered and gray, or has bare spots in the finish, it's time to re-stain. Contact us today for a free deck staining quote. Be sure to ask about our deck maintenance programs to keep your deck looking like new. Deck care ideas and techniques all come from experience, and no two jobs are the same. Having countless jobs over the years using the best ideas and techniques that have helped working to protect decks, arbors, and trellises, gives the staff at Eco Paint an upper edge, at a lower costs, having much higher quality of results. Keeping in mind, limiting the number of times you power wash is best, as this harms the wood, taking off the older outer layer of wood each time. Knowing this, applying the best wood cleaner, thereby limiting the amount of high pressure water blasts to the wood surface is by far the best any deck could ask for. The technique we use is keeping the wood surface wet, applying cleaner multiple times, like swabbing a ship's deck floor, not letting it dry out until the power washing is done. Power washing must be done in a even, not too close, uniform fashion. Save Time and Money, Protecting & Enjoying your Outside Deck! Welcomed to email us directly at [email protected] Either way, someone will be back in touch with you very soon.